Hey everyone! 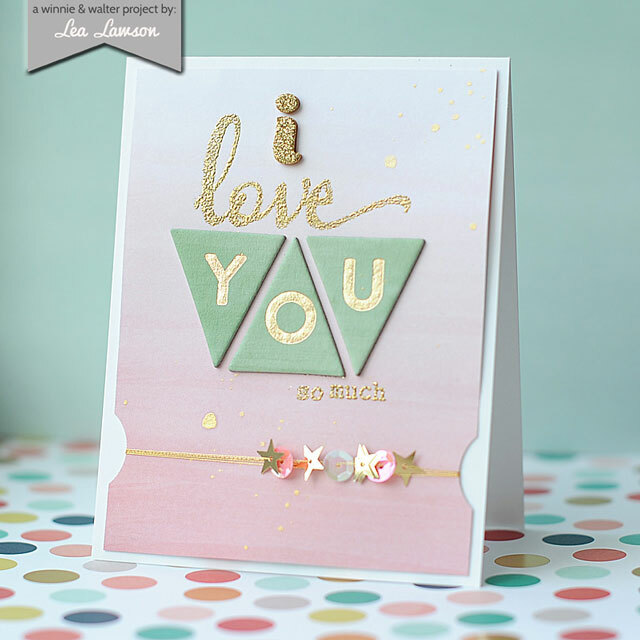 Lea here today to share a love themed card using dreamy pastel colors with sparkly & shiny gold!! I've paired some Winnie & Walter stamps with some of my favorite scrapbooking products. 2. Cut pink paper slightly smaller, then adhere the chipboard triangles to the middle. 3. Stamp & heat emboss the word "love" & "so much" around the triangles. 4. Add gold mist droplets to the front. 5. Finish the sentiment with a gold glitter thicker "i". 6. Punch notches to the bottom of the paper block. 7. Wrap sequin threaded gold thread around the notches & secure on the back. 8. Add the entire stamped block to the white card base to finish. I really hope that you have enjoyed my card today!! Have an awesome weekend, and I hope you get some stamping time in with our favorite Winnie & Walter stamps! What a stunning gold accented card...love those triangles and the twine threaded with sequins! Love the dreamy pastel, sparkly sequins and gold combo. Fantastic card!!! So many unique elements. Loving the little punched sides to hold the string of sequins. Gotta give that a try for sure! I love the sequins on the string! Oh so pretty! Love the gold sentiments. 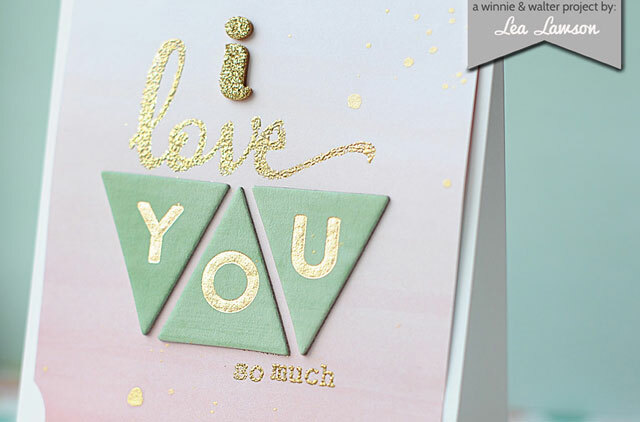 STUNNING card Lea - LOVE your ELEGANT design and beautiful color palette, the gold embossing is GORGEOUS and the notches a great way to hold the threads securely in place!!! Wow this is a beautiful card, the gold and the color palette is simply stunning. 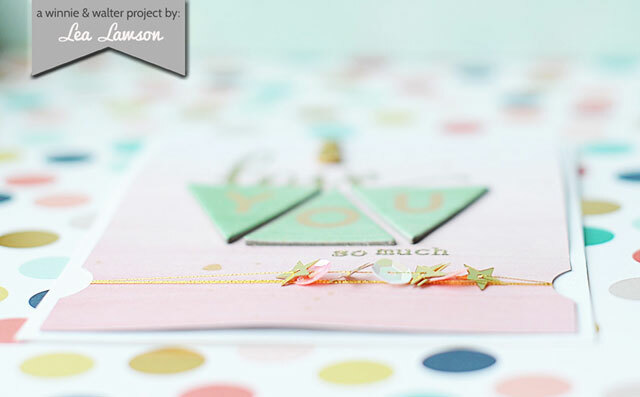 Love the sequins threaded across the card!!!! I love this card! All the details are perfect - right down to the gold splatter! What a pretty card! I love every detail, the threaded confetti, the gold accents, even the notches to hold the thread!